When you first see a suitcase or a piece of large luggage, the first thing that probably comes to mind is a really nice destination that could help you take your mind off the surrounding reality and stress. For some people, however, life isn’t a continuous vacation, which is why even short term holidays have to be planned ahead months before actually going somewhere. For some, carrying bags might be a part of their job, when you're a frequent business traveler, you depend on a quality luggage brand to make your travels easier. When the moment comes for you to start your trip, the luggage you take with you is one of the most important things of all, except for your attitude and good mood. It usually contains all of the things that you need to feel comfortable far away from home, such as your clothing, personal care products, accessories and more. It is important to have a high-quality luggage that endures all kinds of travel. Buying a poor suitcase can cause a lot of discomfort and anxiety. Also, even though you might not be aware in the beginning, cheaper products can sometimes end up in costing more, because they don't last long. First, you pay for the “cheap” suitcase and second, you pay for another suitcase in case the first one breaks. Obviously, it is extremely important to buy a nice, stylish and durable luggage that is worth your investment, even if it means that you will pay a little more. In this article, we will recommend some of the best affordable luggage brands on the market, based on our personal reviews and consumer reviews. But before we start describing the products that we have analyzed and reviewed, we must bring into discussion the most important features of high-quality luggage. When reviewing the suitcases below, we took all these factors into account, including the price and the warranty that covers them. Read on and decide which one is the right luggage set or piece for you. We hope that the information we have to offer will help you find the right fit for your needs and make carrying bags less of a problem. VonHaus presents one of its top luggage brands that can be bought in dark grey, light grey, blue, light blue, lime, orange, pink, purple or dark red. This set of three suitcases is ideal for those of you who travel often, but have different needs at different times. The set contains a large, medium and small suitcases that have a stylish design, are lightweight, are equipped with four wheels and have a 360 degrees rotation. All three suitcases have a zipper closure and security features, such as the combination lock and the zip loops that are ideal for TSA-approved padlocks. The wheeling is quite good, although the wheels are made of plastic. The handles are telescopic and rather sturdy, so you can rely on them to be durable. 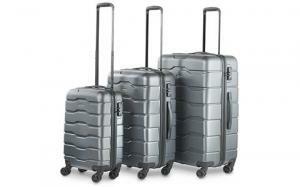 The luggage measures 31 x 20.8 x 12.2 inches , the medium one 18.2 x 10.3 x 26.4 inches and the large one 20.9 x 12.1 x 30.4 inches. Other than the nicely-designed shape of these pieces of luggage, they bring you basic safety features and the comfort that you need during your travels, thanks to the 36-degree rotation of the wheels. Another advantage that their design offers is the fact that they have secured corners, which protects the suitcase better and makes it look more interesting. Moreover, the set is affordable and suitable for the entire family. The VonHaus set might be an affordable alternative with a great design, but it is not your premium choice. The plastic wheels and the sound they make might disappoint you, especially if you are a rather picky traveler. In this case, you might want to check out some more expensive alternatives. If you have special taste when it comes to suitcases, this set of three could be what you are looking for. It has an interesting design with various patterns, depending on the model that you decide on. You can choose between dark or light brown, golden-grey and pink. The set includes three pieces of luggage: a large one, a medium piece and a small one, all with the same elegant patterns. Use the one that matches each trip. If short and only requires light packing, use one of the smaller ones. If you need more room for packing, use the larger one. If you're traveling with family, use them all, one for each! The suitcases have four spinner wheels, flexible handles and a push-button locking durable handle system that helps you secure it in place while on the move. Also, it has inner organizers that are easy to use and practical, as well as fully lining interior. The exterior of the suitcases is made of Checker Jacquard polyester material that is waterproof and somehow hard. The front panels are EVA foamed. Except for its remarkable design, there are other benefits that this set of suitcases offers and that are not so obvious. For instance, its ergonomic design, its flexibility, and expandability. Also, when moving, you can observe that the suitcases are stable, easy to turn and slide. We have discussed a lot about this set of luggage's design, which is why we must mention that it will not be something that minimalists will like. Another minus of this luggage set is that it does not include any security features. You can, obviously, buy extra padlocks or modern locking systems, but that will cost you extra. If you expected this review to be focused on adults only, you were mistaken. When going on a family trip, it is important that your children have their own personal luggage piece. This tiny suitcase is highly adaptable, flexible and comes with a cute design that will make your daughter fall in love with it. It is made of 100% polyester and it measures 14.5 x 6.5 x 18 inches. This children’s piece of luggage is pretty cheap, so you won't break the bank for it. This is a small price to pay in order to make your child happy especially when traveling and you need them to be in a good mood. Just like the adults around, little girls can carry this comfortable suitcase around with the help of an extendable durable handle. Its zipper pockets help you organize her things in a more efficient way that will give her quick access to her belongings. 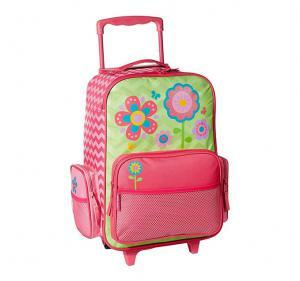 What’s to like about the Stephen Joseph Little Girls Rolling Luggage? Except for the obvious, this cute little piece of luggage has advantages that most little girls will adore. It can be easily lifted thanks to its upper fixed handle and it has two wheels that help the child carry their own luggage without requiring the help of parents. Also, it is made entirely of polyester and can be hand washed at any time. The fact that the entire structure of the luggage is made of plastic could raise a question mark, especially if you are looking for a durable children’s luggage. It does not look as sturdy as many would want it to be, but it can be used comfortably and safely thanks to its wheels and flexible handle. One of the most interesting products on this list is the backpack car seat, which is a multifunctional type of luggage that will help you secure your child while in the car, as well as to carry some of your belongings with you when you travel. Did you ever think how helpful it would be if you would be able to take your car seat with you and protect your child in the best way possible? Now you can, thanks to this large, comfortable-to-carry car seat travel bag. It can be carried easily thanks to its straps that are padded for your comfort. Also, it has an ergonomic design that will not make you feel uncomfortable during your travels. More importantly, it is made of heavy-duty fabric that is durable and water resistant. What’s to like about the J.L. 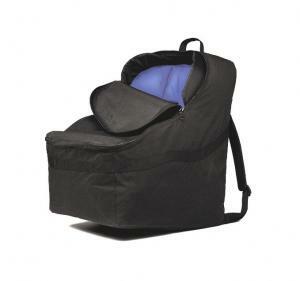 Childress Ultimate Backpack Padded Car Seat Travel Bag, Black? This product is an excellent invention for families who travel with their children. It offers hands-free convenience, flexibility, and mobility. More than that, it offers the parents the chance to take their favorite car seat with them, making the child as comfortable as possible and securing its journey all the way. What’s even better about this piece of luggage is that airlines do not charge you for it and you can store all kinds of children’s accessories and care products inside. Although this travel bag is easy to use and very practical, it has a few small inconveniences. First, some would consider it a bit too large for their taste. Second, its design is considered to be a bit too dull. These days, traveling doesn’t happen simply for relaxation purposes. Most people travel for business purposes and even when they don’t, they still need to take their laptop along with them. If you are one of those people who prefer to be close to technology even in their journeys, this travel backpack is ideal for you. It is cheap, comfortable to wear and stylish enough to fit a sophisticated outfit. It comes in a variety of colors that you can choose from and it has different patterns and designs. Its manufacturer recommends it to be used for 14-inch laptops or simply as a travel backpack. It is made of high-quality polyester that is heat resistant and durable. It will protect your laptop thanks to its thick padding and it will offer maximum comfort during your travels due to the padded straps. What’s to like about the Vaschy Unisex Classic Water Resistant School Rucksack Travel Backpack 14Inch Laptop? This travel backpack that can be used to transport your laptop is nicely designed, comfortable to use, made of heavy-duty materials and resistant to shrinking. Also, it protects your belongings from heat and water and it is fully padded. Moreover, it has five inner organizers that help you keep tiny objects or important documents at hand. Also, it has a front pocket and a side pocket that can be used to carry liquids. 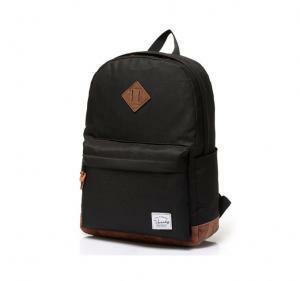 This is an inexpensive travel backpack that is suitable for the times when you need to take your laptop with you, but you should not trust it too much with heavy weights. It is made of durable materials, but its seams don’t give customers a high level of confidence. Keeping an eye on the weight of the objects that you carry is not very convenient. Does the brand of your luggage really matter? If your budget is low and you need a luggage urgently, you will surely not be looking for branded bags. But the truth is that if you want a luggage that is durable, lightweight, compact and well-organized, then one that is made by a renowned, specialized manufacturer is the best option. Although making luggage might seem easy, there is a lot of effort and engineering behind some of the best luggage in the world. If you want it to be lightweight and durable, it must be made of modern materials that aren’t heavy and that ensure its resistance to shocks, cuts and more. Packing can be a burden, but it can also be a pleasure if your luggage has features that help you place all of your clothes, shoes and accessories wisely, in an organized way. Luggage that come with various compartments, zippered pockets, garment bags and shoe compartments are extremely popular. Instead of spending hours trying to put everything in the most convenient place, thinking about space saving and weight, you can simply put everything in the designated space and leave. These elements aren’t usually found in cheap bags and suitcases, as they only offer the basic advantage of being able to transport your personal belongings with you while traveling. Specialized brands create luggage with practicality, utility and comfort in mind. How often should you replace your luggage? This question leads to another answer that involves money. Although it doesn’t mean that an expensive luggage is necessarily the best in its class, you should be ready to pay a bit more for durable bags. If you choose a low-cost luggage, you might be forced to replace it once a year, as its materials, wheels or handle will not last long. How often you replace it depends on how much you travel. If, hypothetically, you must use it every month, a high-quality luggage should last for approximately 3 years. You know that the time has come for you to replace it when the exterior or interior starts to fall apart, when the zippers no longer work as they should or when the handle starts to deteriorate. One of the most frustrating experiences that you can have while traveling is having to carry your luggage with your hands in case it breaks. So, next time you buy a luggage, think about it twice. What is the ideal luggage size? Are you a long-term traveler or a city-break enthusiast? Are you a fashion-addict or a minimalist? These are the main questions that you should ask yourself before deciding which size is ideal for your needs. There are travelers who plan on staying at least one week abroad, but they only need a few things. They choose Airbnb accommodation where washers and driers are available, so they can refresh their clothing. For this category of travelers, even a cabin luggage is enough. If, on the other hand, you are a long-time traveler and you know that you need a lot of clothes, shoes and accessories, then the best suitcase size for you is probably 28 inches to 32 inches. This falls in the large category of luggage and you will have to check it in regardless of the airline you fly with. Traveling should be comfortable and help you relax, which is why you should always choose the best pieces of luggage for your needs. Whether you are traveling for business or relaxation purposes, you should take a good, durable suitcase with you that will not fail you. You shouldn't worry about your checked luggage on your flight, instead, use one of the reviewed product ranges and keep your mind busy with more important matters. Look for the most interesting innovations on the market if you are traveling with your family and make your life easier by buying a travel bag such as the one at number 4. Choose a classy, sophisticated laptop travel bag if you want to be connected to the rest of the world and work at the same time or choose a suitcase set if you have set some traveling goals for this year. You never know where life takes you, but with a good piece of luggage travelers can have an easier trip, less stress and require less physical effort. Choose the one that suits you best between the above luggage models and ensures that your journeys are safe and comfortable from the beginning until the end.